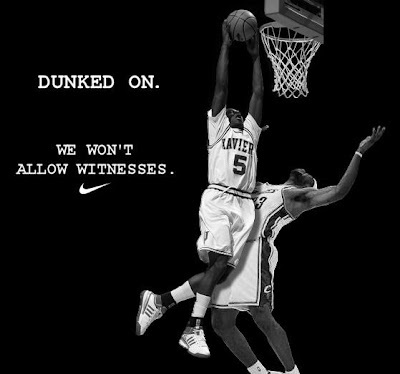 This is a classic dunk and probably one of the most famous college dunks of all-time. Should have had this one up a long time ago. Does anyone know what team this was against? I don't remember. J-Smooth catches a nasty one on Primoz Brezec. Shawn Kemp with the offensive rebound and dunk on Felton Spencer, via GoldLakerLion. Jordan Farmar with an impressive dunk on Tim Duncan. Josh Smith bams on Kevin Love at the USA Team workouts. Kobe with a nasty alley-oop poster dunk on Viktor Khryapa. ....oh wait, there's no video of this because Lebron or maybe Nike doesn't want anyone to see it. Pretty pathetic if you ask me and I now am officially sick of Lebron James. Thankfully, there's enough video of Lebron getting dunked on for me to post here and everytime he does get dunked on I'll post those links here too. If you have video of any other times Lebron got dunked on just send it on over (antone2382@gmail.com). Let's see if Nike and Lebron try to shut this post down. Shaq spins around Joakim Noah and then dunks on Tyrus Thomas. 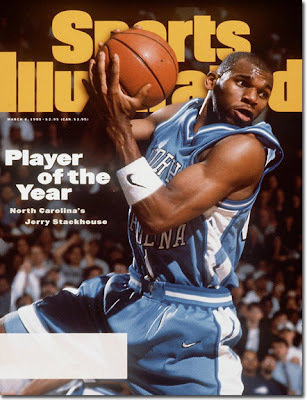 This is a pretty nice mix of Jerry Stackhouse dunks from his UNC days with a couple of extra nasty poster dunks towards the end of the mix. Definitely worth checking out. Via knubberrub. JaVale McGee destroys wonder boy Blake Griffin. McGee has some serious length by the way, no reason why he shouldn't be able to become a solid low post defender for the Wiz. I'm a little late to this, but I finally setup a Twitter page, so you can follow me on there. I'm probably not gonna post any personal stuff on there, but I'll try to keep things NBA/Sports related and of course whenever I post a dunk I'll update Twitter as well. Also, I need help finding a good "Follow Me" Twitter button, so hit me up if you can help out! Kelenna Azubuike with a brutalizing putback slam against Vanderbilt, via ukcat8fan. MJ dunks on Orlando Woolridge and even though this dunk is crazy old, we actually have a pic to go with the video. Props to GoldLakerLion for the vid. I have no idea who this guy is but I'm sure Quan Powell does now. George Hill with the nasty summer league smash on Anthony Tolliver. Ridiculous dunk from Jason Maxiell back when he was at Cincinnati. Dude just got DESTROYED! Jason Maxiell with the sick and-1 alley-oop dunk on Sasha Pavlovic. Jason Maxiell with the beastly dunk on Lebron. Classic block by Jason Maxiell from last season. Probably one of the best blocks I've ever seen. D.C. dunks on Shaq for his first appearance on You Got Dunked On. Trevor over J.O? Got to be a classic...but somehow this dunk didn't have it's own post...so now it does. I know a pic of this must exist somewhere so hit me up if you know where I can get one at. Marcus Haislip with the ridiculous putback dunk on Jeremy McNeil. Another rare Jordan dunk, who makes this one look too easy, via GoldLakerLion.